Guwahati is all set to host the grand finale of Sunsilk Mega Miss North East and Garnier Men Mega Mister North East on June 29 and 30. This was informed at a press conference at Rang De Basanti Urban Dhaba on Friday. The finale of the both the beauty pageants will be held at ITA Machkhowa, Guwahati. Garnier Men Mega Mister North East finale will be held on June 29 and Sunsilk Mega Miss North East on June 30. The finalists have been chosen through a series of auditions held in Agartala, Itanagar, Dibrugarh, Kokrajhar and Guwahati from June 1 to 11. 50 women and 50 men will compete for the titles. Designers Dipika Yengkhom, Nitu Kachari, and Akumnaro Imsong will design the finale collection for the participants. The winner of Sunsilk Mega Miss North East will win a price package worth Rs 7 lakhs, which includes the winning crown, sash, a cash prize of 1 lakh and a chance to become the face of Sunsilk’s print and outdoor campaigns. 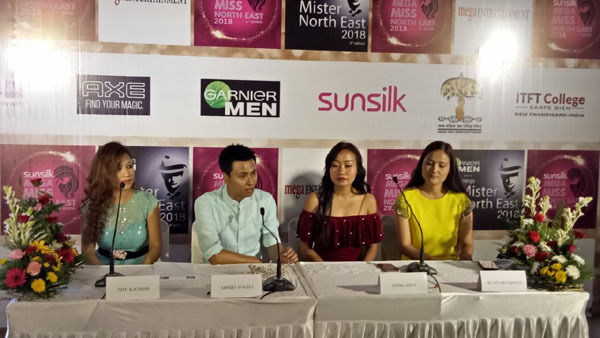 The winner of Garnier Men Mega Mister North East will win a price package worth Rs 5 lakhs which includes the sash, trophy and a cash prize of 1 lakh. The price package of both pageants include a trip to Dubai. Mega Entertainment has also teamed up with Assam State Biodiversity Board (ASBB) to raise social awareness about biodiversity. Awareness campaigns will be held at various places rich in biodiversity.